Ministers from Britain, Spain and Gibraltar have signed a series of agreements aimed at improving living conditions for the people of Gibraltar. The accords include easier border crossings and better transport and telecommunications links between Spain and Gibraltar. But they do not cover the thorny issue of the Rock's sovereignty. Britain has held Gibraltar since 1704. Spain ceded sovereignty in 1713 but has repeated claims to the territory. In 2002, the people of Gibraltar overwhelmingly rejected a proposal that Britain share sovereignty over the territory with Spain. 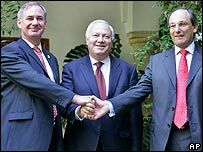 The signing by Spanish Foreign Minister Miguel Angel Moratinos, UK Minister for Europe Geoff Hoon and Gibraltar's Chief Minister Peter Caruana follows nearly two years of talks. Mr Hoon, who described the agreement as "historic", said: "It shows we can work together to make a difference in the lives of normal working people on either side of the Gibraltar border." The BBC's Danny Woods says although the argument over sovereignty remains, this agreement demonstrates a significant improvement in relations between Britain and Spain over the disputed territory. The deal - signed in the Spanish city of Cordoba - will open up Gibraltar to flights from Spain and other European countries. 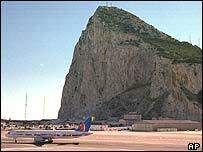 Up until now, Spain has only allowed flights to Gibraltar from Britain. Commercial aircraft will no longer need to perform complicated approaches to avoid using Spanish airspace, although Madrid has not eased restrictions for military flights. Other measures include softening border controls to reduce queuing time and also boosting the number of phone lines into Gibraltar. Gibraltar, a limestone outcrop on the southern tip of the Iberian peninsula, occupies a commanding position at the western gateway to the Mediterranean Sea. It has been ruled by Britain since 1713 under the terms of the Treaty of Utrecht.